Unraveling the birth of the original fake Cherokee tribe in Missouri is complicated. There are several groups that claim to be the original, but the documents filed with the state, the available group histories, and interviews with people involved at the time make it clear which group was the first and which groups splintered from it. The most active at this time appears to be the Northern Cherokee Nation (aka NCN), a non-profit out of Clinton, Missouri. The group claims to be the original "tribe" and says, on its website, that the Northern Cherokee Nation of the Old Louisiana Territory split from them. The fact the OLT group is the original is also supported by both the history of the group, We Are Not Yet Conquered: The History of the Northern Cherokee Nation of the Old Louisiana Territory by Beverly Baker Northup, and by J.C. Thompson, a founder of the OLT group and key player in developing it into the entity it is today. The Northern Cherokee Nation from Clinton, Missouri did not become a state non-profit until 1991 and that only happened after conflict and turmoil in the original group. Much of what the NCN claims is their history occurred years before they were an autonomous group. Because the NCN sprang from the original group, it is impossible to write the authentic history of it without first addressing the history of the group from which it splintered. The key events in the early history of the OLT are numerous. In an effort to explore these events in condensed form, it seems best to present a timeline of them first and explore each topic (recognition, grants, gaming, etc...) individually in later posts. 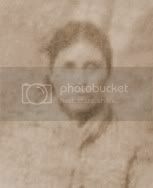 Beverly Baker Northup and her sister, Margaret Foley, became involved with the OLT after finding a letter at the Missouri Historical Society written by J.C. Thompson about the "Northern Cherokee Tribe." J.C. Thompson sent a letter to Margaret Foley that listed the group leaders, including himself as Director of Tribal Affairs. Others listed were Dave Quentin, Virgil Simons, Lucy Kaufman, Cliff Harris, Jr., Marlene Corwin, Jess W. Cutting, Calvin Green, Everett J. Harris, and Betty Simmons. Thompson said the leadership had taken a vote and it was 10 votes yes, 2 not voting, to have the permanent tribal office in Columbia, Missouri. 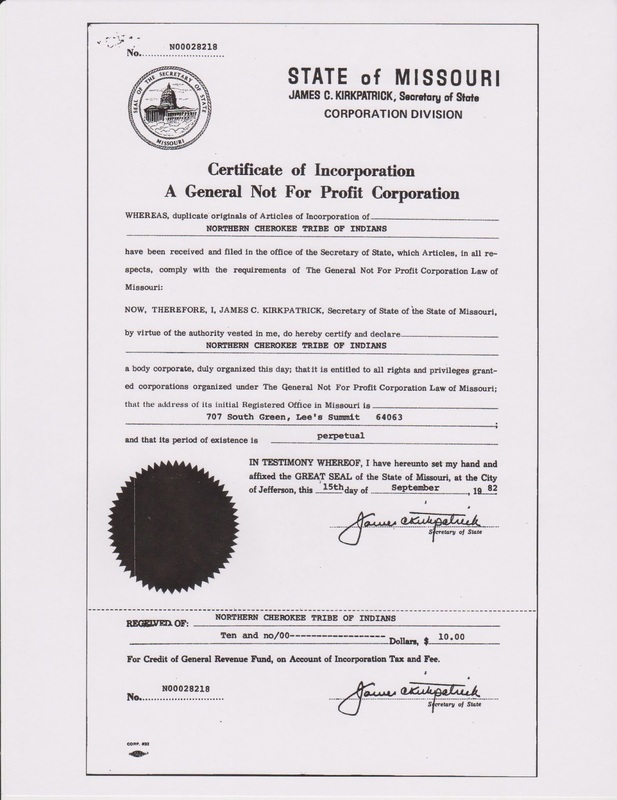 The group registered as a non-profit through the state of Missouri as the Northern Cherokee Tribe of Indians. 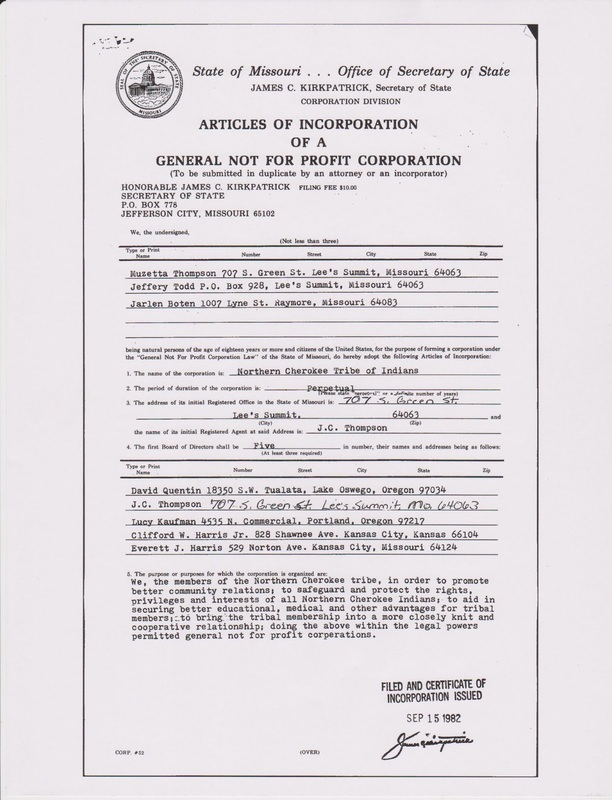 J.C. Thompson was the registered agent for the group. An application for an Administration of Native Americans (hereafter ANA) grant was filed. Amount requested was approximately $86,100 in salaries, with the largest salary going to J.C. Thompson for $26,000. The grant was denied. The group considered an attempt to get the "Green Settlement." There were disagreements over the "money" and no attempt was made. In order to raise money and at the suggestion of J.C. Thompson, the group formed a new non-profit, Northern Cherokee Indian Community Association. "Non-tribal" members were allowed to join for a fee. Baker Northup agreed with the idea, but some in the group did not. Inner conflicts began. J.C. Thompson, Margaret Foley, and Beverly Baker Northup met with State Senator Roger Wilson about obtaining state recognition. The group received a proclamation from Missouri Governor Christopher Bond. Baker Northup became registered agent for the "tribe." J.C. Thompson said he would step down from his position as Director of Tribal Affairs unless the group got some money. He did eventually resign his position that year, but remained active in the group. Chet Ellis of the Indian Center in Kansas City, Missouri opposed the group and repeatedly stated there was no such thing as a Northern Cherokee Tribe. The group reached out to Missouri State Representative Chris Kelly for a legislative act to give them state recognition. The group received a Missouri House Proclamation of Recognition signed by Speaker of the House, Bob F. Griffin. Baker Northup was "elected" chief. The group attempted to get legislative state recognition again. Representative Chris Kelly and Senator Roger Wilson assisted. The act passed the House but died in the Senate Committee. The act was attached to another bill to try to get it through the legislature. The bill passed in both the House and the Senate. The Cherokee Nation opposed the state recognition of the group. The bill was vetoed by Missouri Governor John Ashcroft who said he believed only the federal government had the authority to recognize Indian tribes. The group changed the name of their non-profit, Northern Cherokee Indian Community Association, to Tsa-la-gi Wa-sha-she. The group received an ANA grant of $25,000. 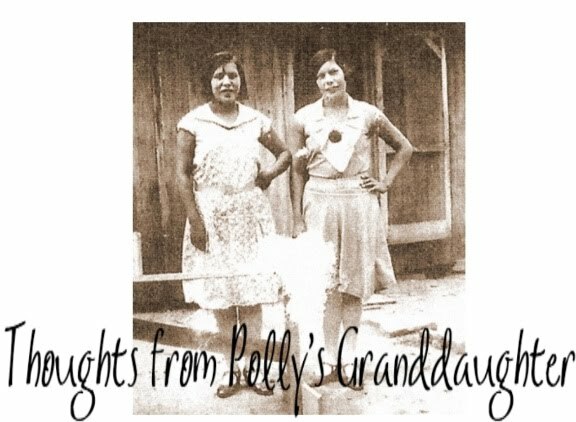 Sandy Clark, Beverly Baker Northup and her daughter, Sherry, started research for federal recognition, paying themselves from the ANA grant funds. The group sent a Letter of Intent to the BIA in 1985, though the letter is now credited to the Northern Cherokee Nation in Clinton despite the fact they did not yet exist. Internal conflict started over the ANA funds. 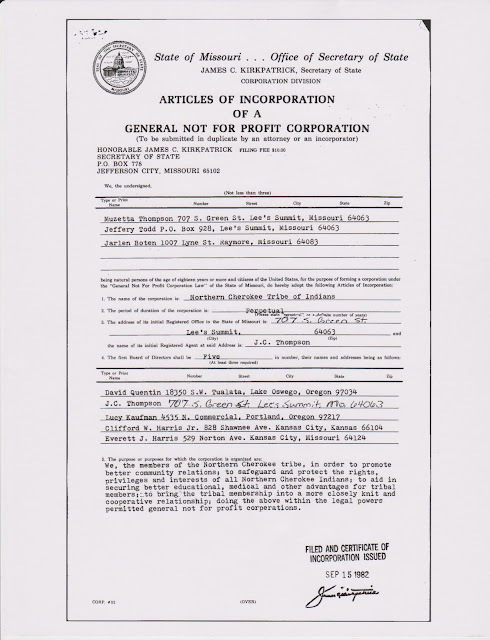 J.C. Thompson and others felt they should have a share. Chet Ellis opposed the group receiving any grant or money intended for tribes or Indians. They applied for another ANA grant. They were denied. They were denied for a Missouri Surplus equipment grant. They were awarded another ANA grant. They received $30,000. J.C. Thompson started a "culture group" called the Chickamauga Community Organization and wanted to attach it to Tsa-la-gi Wa-sha-she. The Sac River area people were the most interested in it but later that interest waned due to political issues. The group gave up on state recognition in Missouri and attempted to gain it in Arkansas. Their attempts were unsuccessful. Carl Griggs applied for enrollment and wrote a letter to the OLT explaining he'd like to open bingo parlors under their non-profit status and promised to give 12% of earnings to the group. Baker Northup and others rejected the idea. Past conflicts started to escalate. There was lots of turmoil and conflict in the OLT. J.C. Thompson suggested Baker Northup issue a state of emergency, suspend the constitution, and name him Administrator. He said then she and the other leaders could resign and go quietly, leaving him as the new chief. Baker Northup and Elva Beltz, sister of Carl Griggs, became candidates for chief. A letter was sent out to group members saying Elva Beltz would pursue the Green and Alexander Brown settlements if "elected." Elva Beltz was "elected" chief. Dan Coones was "elected" Deputy Chief. Baker Northup did not acknowledge the "election" results. The Beltz/Griggs faction and the Coones/Thompson faction had a falling out. Beltz was recalled. Coones believed he should be chief. Baker Northup again refused to relinquish power. 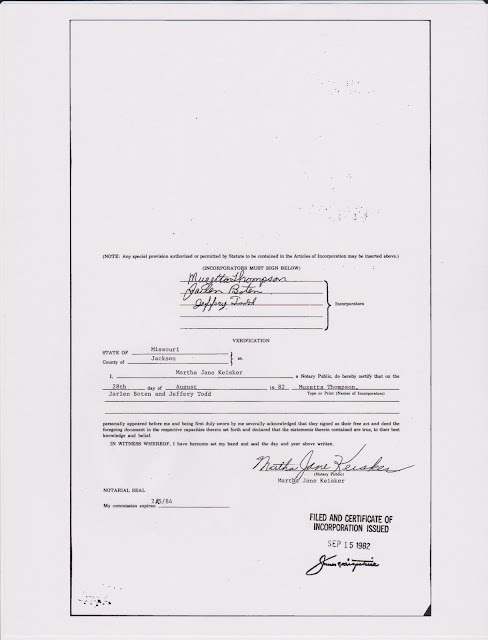 February - Elva Beltz usurped Baker Northup as registered agent for Tsa-la-gi Wa-sha-she. May - Baker Northup regained her position as registered agent for Tsa-la-gi Wa-sha-she. June - The Beltz/Griggs faction started calling themselves the Northern Cherokee Nation and registered with the state of Missouri as a non-profit. Their registered agent was Elva Beltz. As stated above, the history is complicated, but basically that is how one "tribe" claiming descent from Gardner Green on the 1835 Cherokee Nation census multiplied into three "tribes" claiming descent from him. Until 1991, they shared a history and everything happened under the name of the original group that is now known as the Northern Cherokee Nation of the Old Louisiana Territory. Please remember, the heirs of the Gardner Green on the 1835 are known and NONE of these people actually descend from him. This story is far from over, so please continue to follow the story of Young Wolf, son of Mouse; his legacy; and why it all matters.